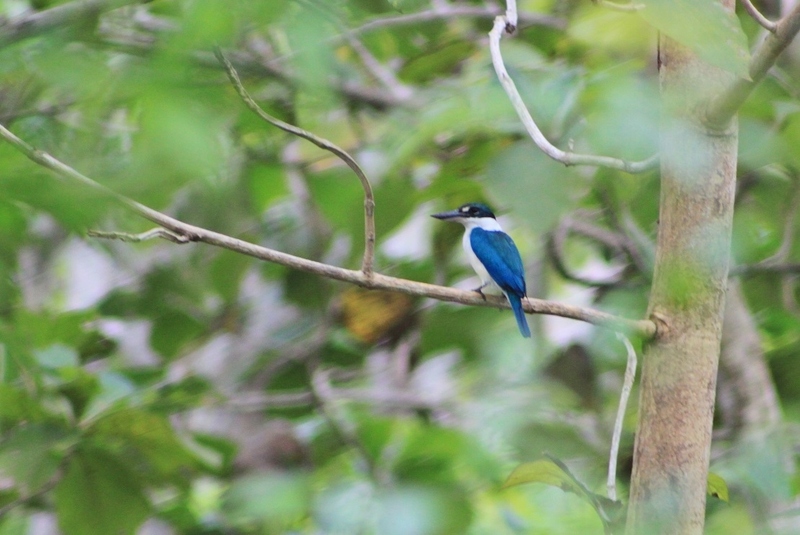 Nusa Ceningan: A Safe Haven for Birds | What an Amazing World! The sound is deafening. All of a sudden, we are met with the flapping wings of a bird with striking yellow feathers with black stripes. In less than three seconds it disappears into the lush forest, and everything is quiet again. 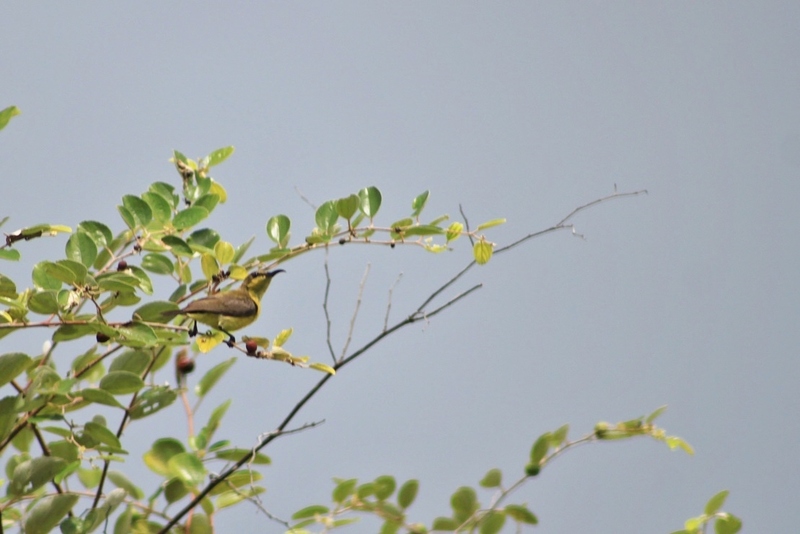 The Black-naped Oriole (Oriolus chinensis) is a bird that often appears on children story books and songs, but I have never encountered one in the wild, until now. Unfortunately the high demand from the pet trade has lead to a steady decrease of their population in the wild, but not in Nusa Ceningan. 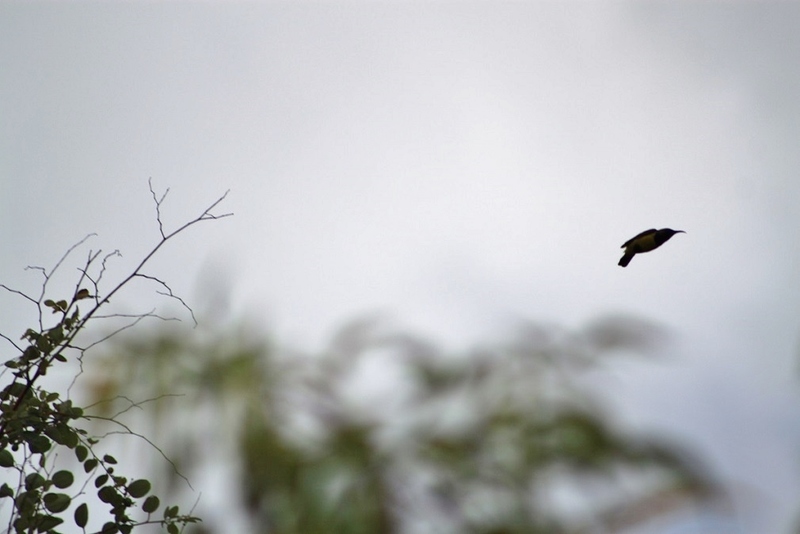 “Let’s do some bird-watching!” I suggest to Alexander, inspired by the beauty of the Black-naped Oriole. 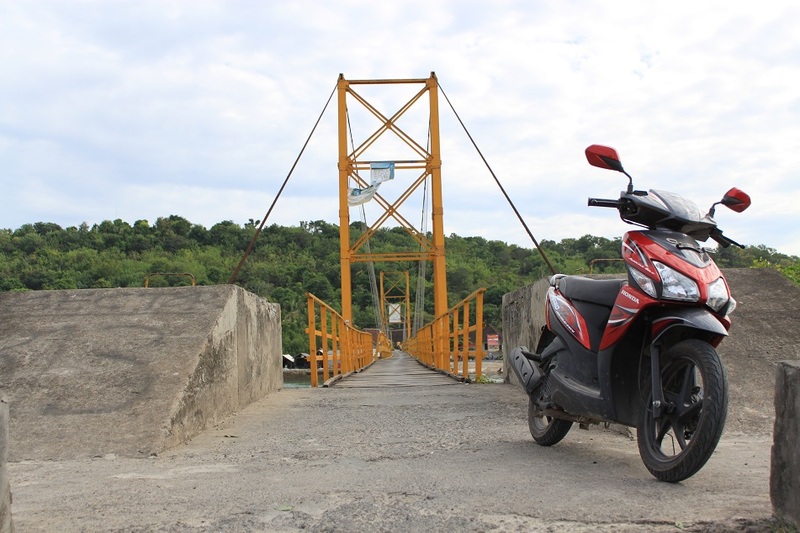 To get to Nusa Ceningan we must cross a narrow yellow bridge which provides the only land access connecting both islands. At one side of the bridge an iron structure fell onto the sea, replaced by woven bamboo to ensure the bridge remains passable. It’s truly a daunting sight, particularly for those who are not used to crossing a bridge on a motorbike. 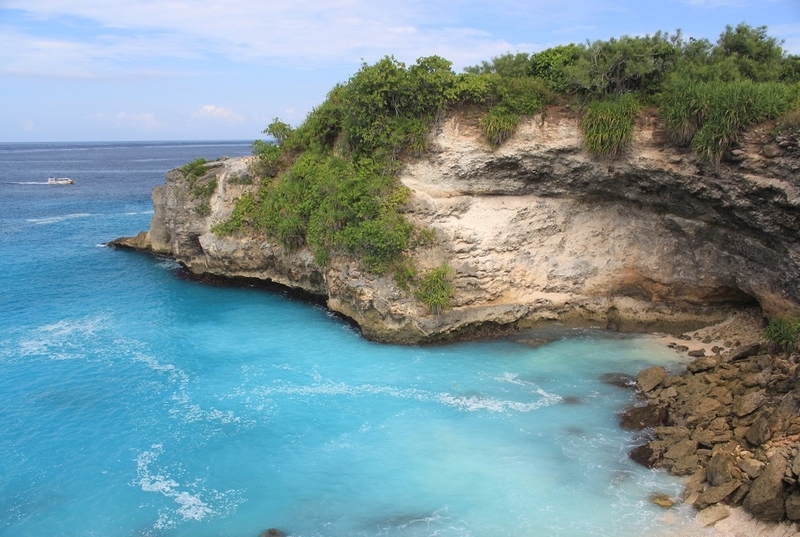 Our exploration of the tiny island of Nusa Ceningan brings us to the Blue Lagoon, a small cove well-hidden from the main road by bushes and trees. “That jumping platform didn’t exist two years ago,” Alexander recalls upon seeing the newly built structure to cater for adrenaline junkies. 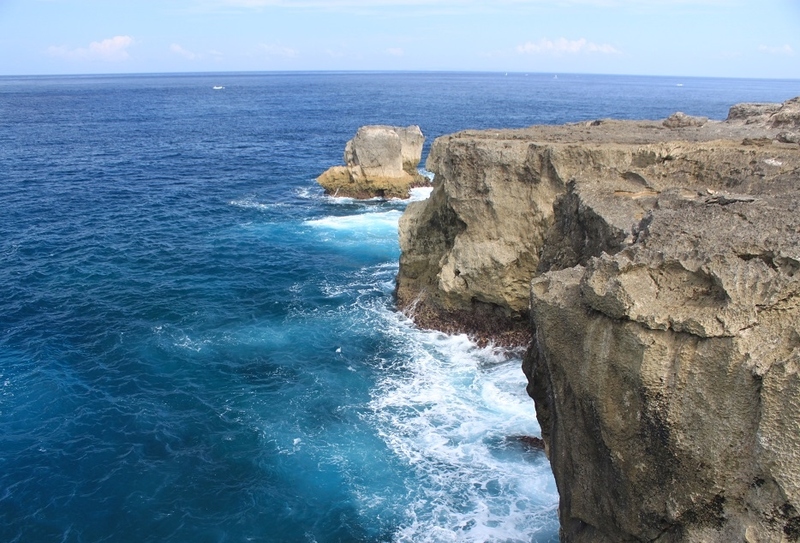 We walk further along the edge of the cliff, tiptoeing amid the sharp rocks beneath our feet while the vast expanse of the blue ocean sprawls into the distance. 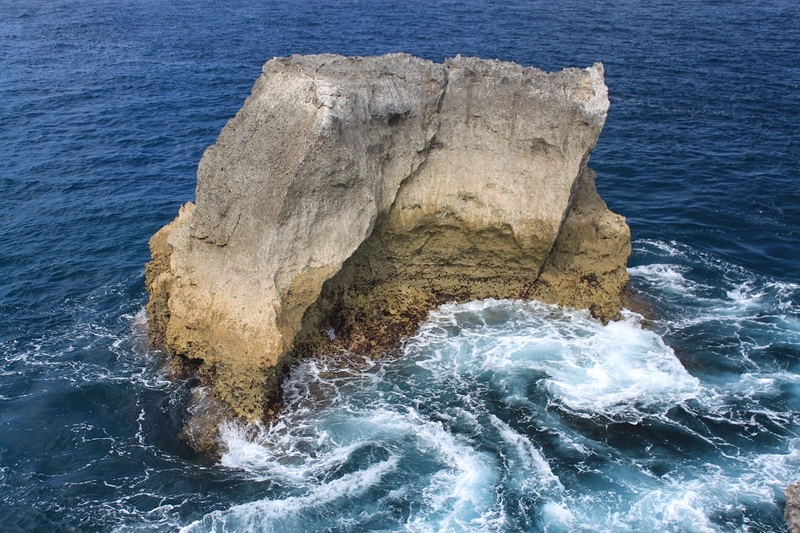 At the other side of the island, close to the tip of the headland jutting into the Indian Ocean, lies Secret Point, which is no longer a secret judging by how many people there were. A world-class surf break beckons surfers to ride the waves, with free divers jumping off a platform hanging on a cliff. 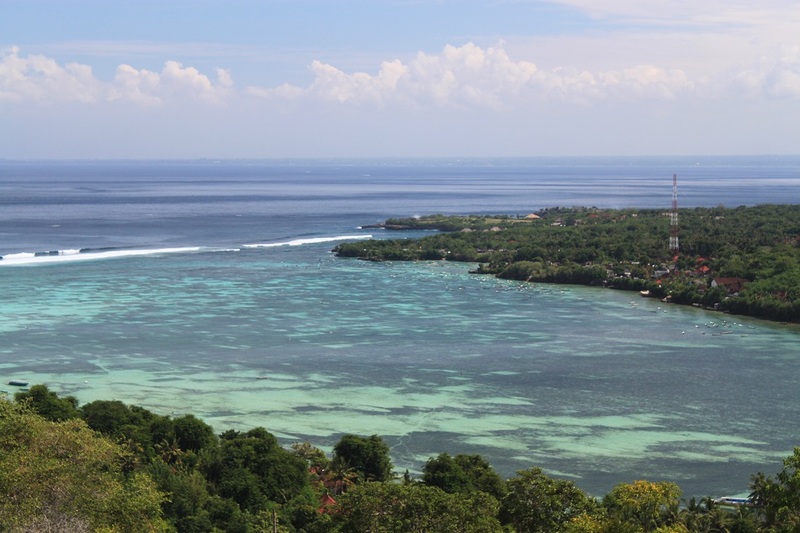 We venture deeper into Nusa Ceningan’s forests, and stop. 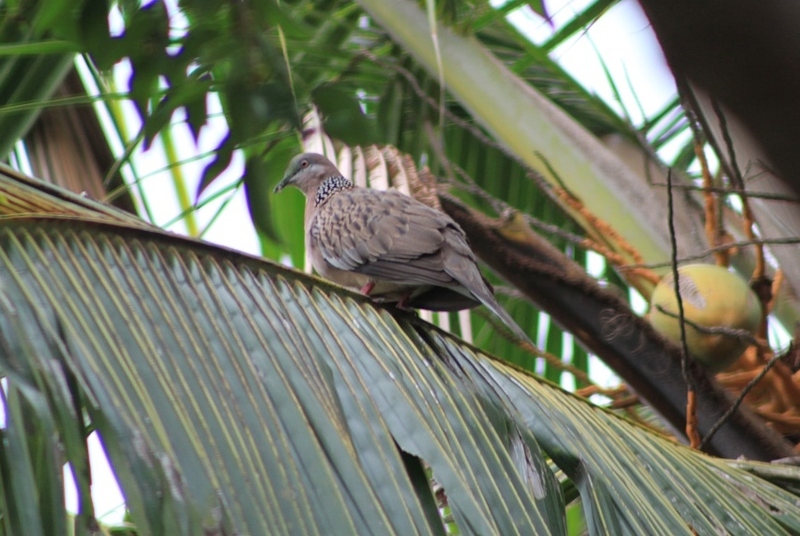 The commotion of different species of birds catches our attention, and bring back my memories of visiting bird markets many years ago. We don’t take any photos of birds here, as they hide behind the trees. However listening to them singing is such a delight; it is so beautiful when animals sing freely in the wilderness. 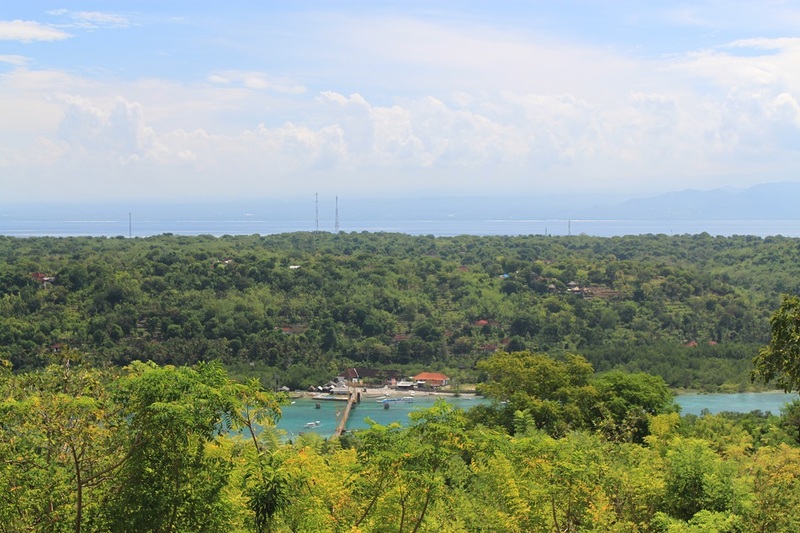 We continue our exploration and reach the highest point on Nusa Ceningan where the yellow bridge is clearly visible. 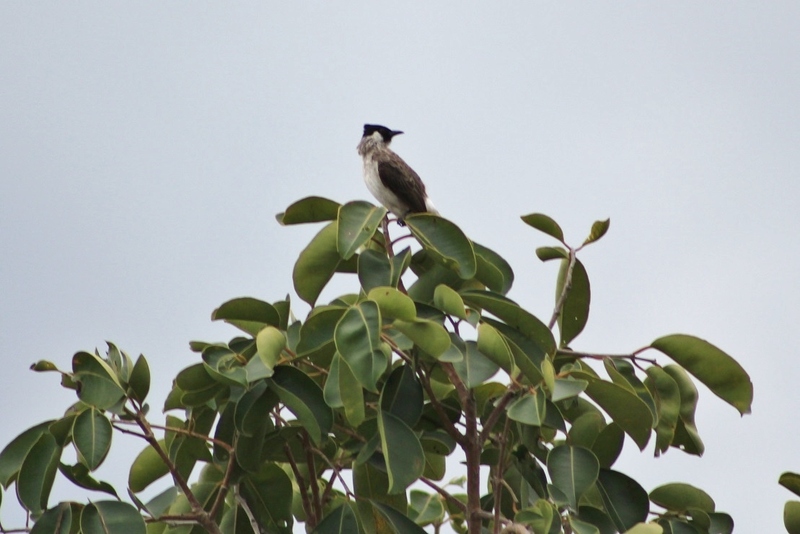 Sooty-headed Bulbuls fly above our heads, moving from one tree to another, too busy to care about us. 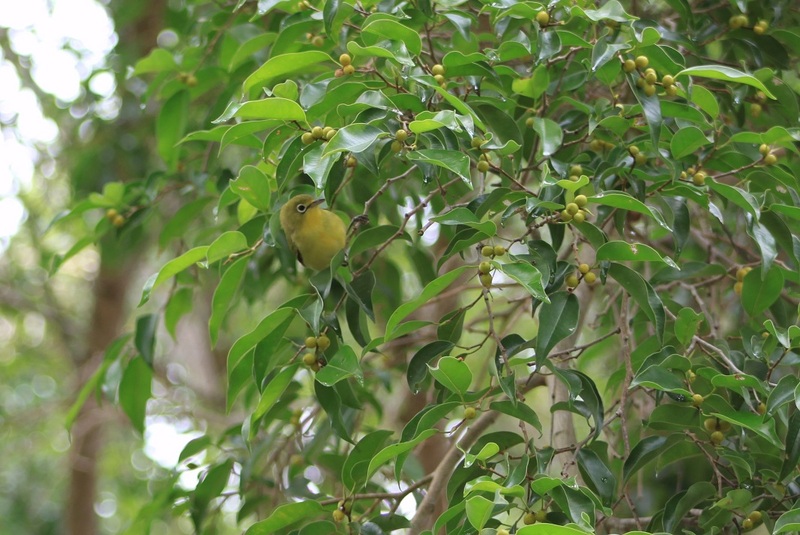 Meanwhile other smaller birds perch on higher tree branches, easily disguised among the foliage. 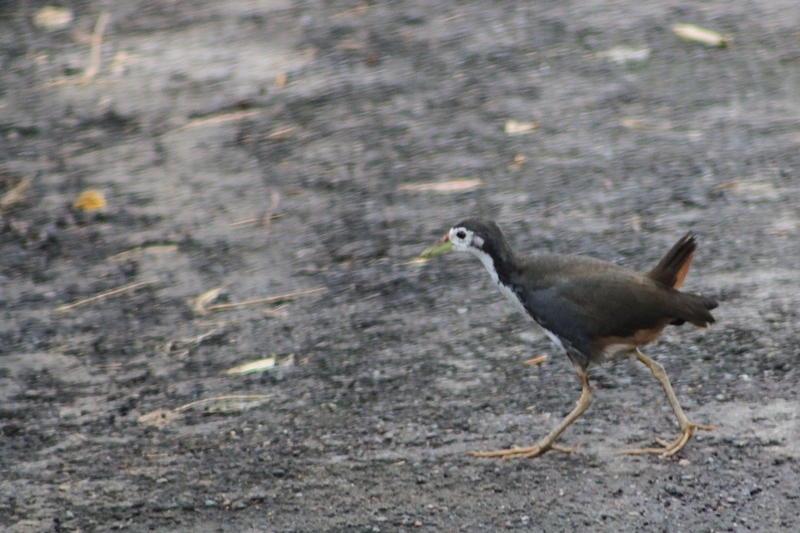 When we are walking around, a chicken-sized bird suddenly flies low above the ground, hiding behind the trees. Curious, we look closer to investigate, but it is too shy to show itself. 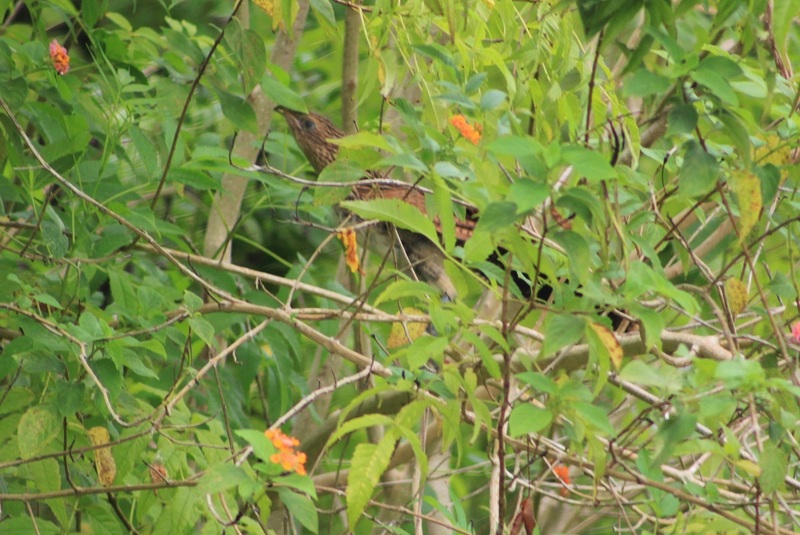 We only manage to capture some obscure images of the bird, which turns out to be a junglefowl. 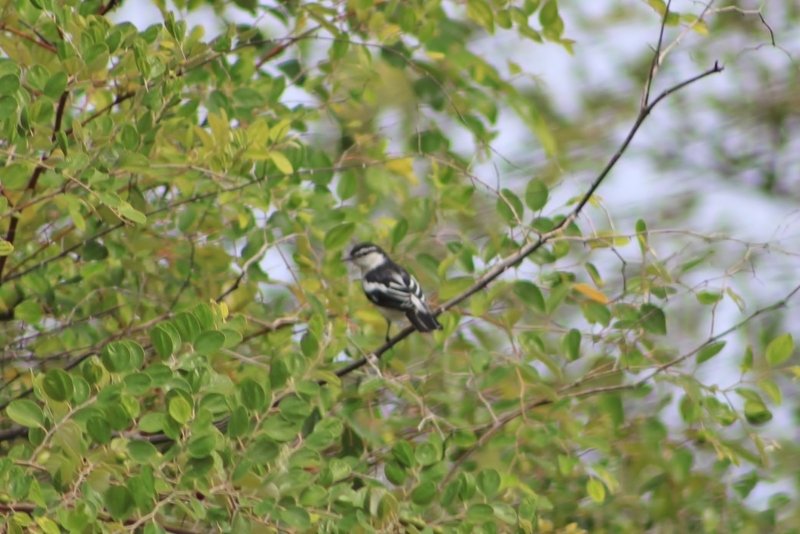 Our hunt for bird pictures is over, such an impromptu idea without using proper telephoto lens. We are ready to go back to Nusa Lembongan, crossing the same yellow narrow bridge. Just before we get on the bridge we stop by a small food stall to have kelapa muda – young coconut – to refresh ourselves from the heat and humidity of the island. We enter the stall, and discover images not commonly found in houses in Bali. “What happened to the bridge?” Alexander starts the conversation. Even though the locals are living a very modest life, it turns out there are some who speculated by coming to this island in search for a better living. It’s the very same reason that drew people from faraway lands to venture halfway around the world. Hey, I didn’t know that finally you got that Shy Junglefowl and Oriental White-eye! 🙂 Peaceful moment though, at the top of the hill enjoying the sound of the birds. Kecuali yang ngerem motor mendadak pas lihat si Burung Raja Udang yang biru itu, plus kameraku yang ga fokus-fokus hehehe. The Blue Lagoon is my favourite spot in Ceningan. Hopefully ga tambah ini-itu seperti tempat yang buat terjun ke teluk. Thank you for sharing that nice time, both in Lembongan and Ceningan. I did, but as you can see the photos are not that focused. Iya, pas liat si burung misterius itu terbang rendah refleks ngerem, jadinya ngepot. 🙂 I’m glad you introduced the Blue Lagoon because it was such a nice and hidden place, indeed. Thank you! I was hesitant at first. But after seeing some local people crossing it safely on their motorbikes, I started to be convinced. The only thing that I had in mind was keeping the motorbike steady and not thinking of anything else. I don’t think I would jump off that cliff either, well you know how I hate the feeling of falling which kept me on that bridge at Tidung Island instead of jumping into the waters. 🙂 Nusa Ceningan is a nice place to just sit and chill indeed, and it was such an amazing feeling to hear the birdsong. Enjoyed your narrative and beautiful photos. Thanks for sharing. 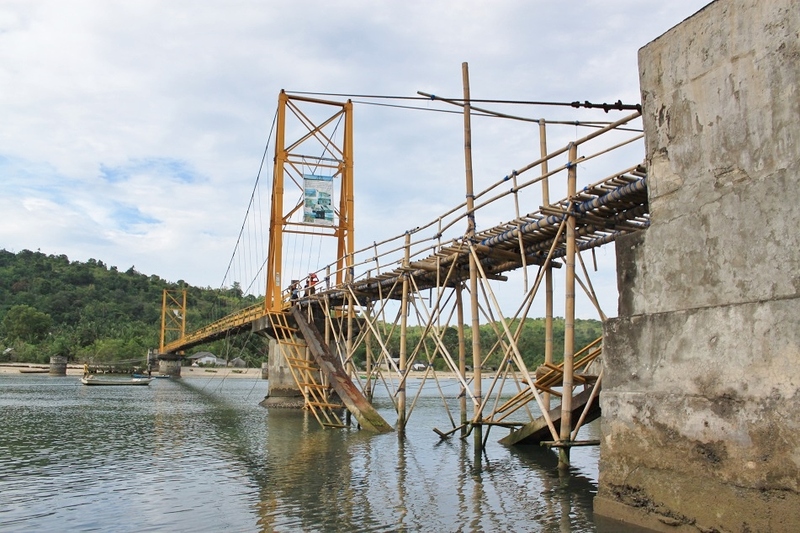 Been to Nusa Lembingan, a long time ago, but never been to Nusa Ceningan and didn’t know about the yellow bridge either. Thanks Eki! 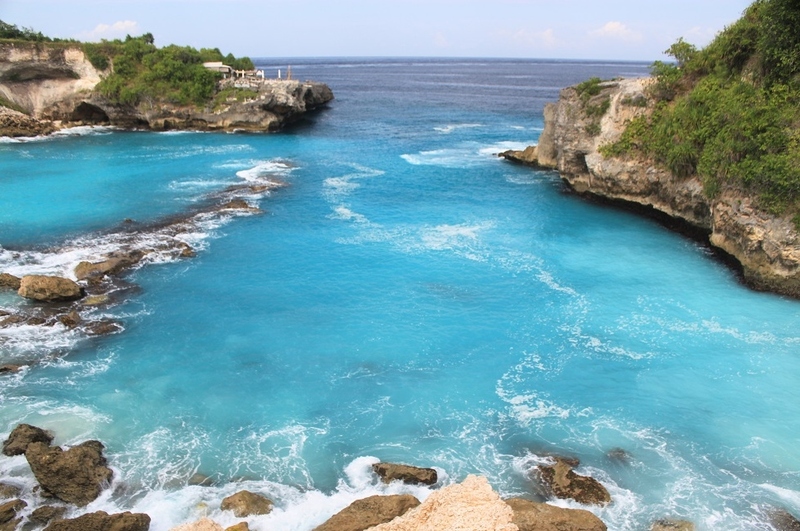 The next time you go, you might want to visit Nusa Ceningan as well since it is a perfect place to unwind. Nusa Ceningan dimananya Bali Bang? Di tenggara Bali, di lepas pantai Sanur, ada 3 pulau: Nusa Penida, Nusa Lembongan, Nusa Ceningan. Dari Sanur sekitar 30 menit naik kapal motor ke Nusa Lembongan. Bener banget! Hari pertama di Nusa Ceningan gak ada niat buat foto burung, tapi begitu liat kepodang langsung diniatin besoknya bird-watching. 🙂 Ke sana pas bulan Juni yang lalu. I heard about the falling bridge that connecting Ceningan & Lembongan for some time ago, and apparently it hasn’t been replaced yet? Thank you for your kind words, always! The blue lagoon was such a beautiful and secluded place on the island, indeed. That bridge surely looks scary haha! Hopefully the bamboo is replaced soon – unless one wants to sue the government like the Americans love to do when one gets hurt. I do hope so. The thing is infrastructure in Indonesia is known to be poorly-maintained. I do hope things change, for good. I am new to the blogging community and landed upon your blog and love the concept and all the pictures! I actually have a blog of my own and would love for you to check out and follow my travel blog and help spread the word! Thanks! Oh so there’s a bridge connecting the two islands! Yes, and crossing the bridge was an adventure itself. 🙂 I didn’t jump off the cliff and decided to take photographs instead while enjoying the sound of the waves. Thank you! Kok bisa sampe dikejar anjing gitu? Tapi Lembongan + Ceningan emang pas banget buat yang mau liburan ke Bali tapi pengen ngerasain suasana yang beda. frames are very nice look, I’m happy. Thanks Sofia! Wish you safe travels and lots of fun as well!